Unipak Nile, in 6th of October City, Egypt meets internationally recognized quality management system requirements. Unipak Nile, corrugated packaging manufacturer, passes ISO 9000:2008 re-audit with zero non-conformity. 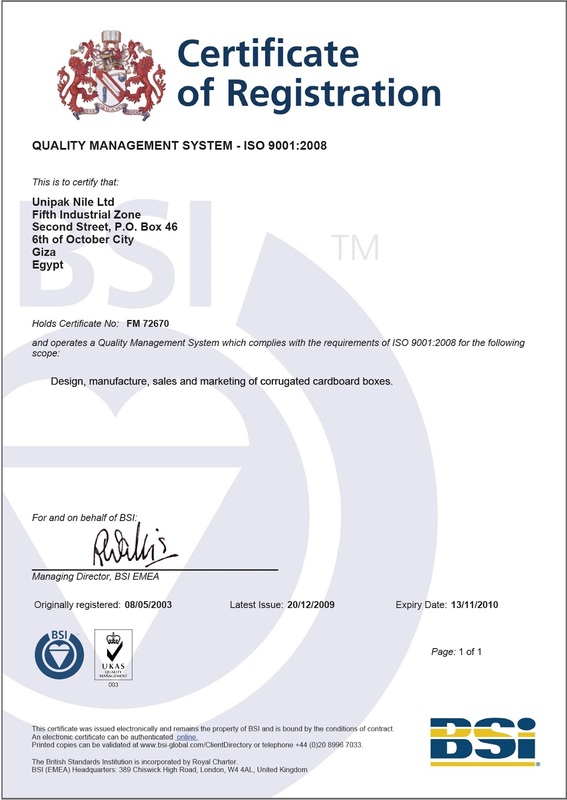 The re-certification validates Unipak Nile quality management systems to comply with ISO 9001:2008 requirements for design, manufacture, sale, and marketing of corrugated cardboard boxes. Mohamed Hassanin, Lead Assessor from certifying body, British Standards Institution (BSI) EMEA, conducted the ISO 9001:2008 re-audit at Unipak Nile plant on 10 June 2012. 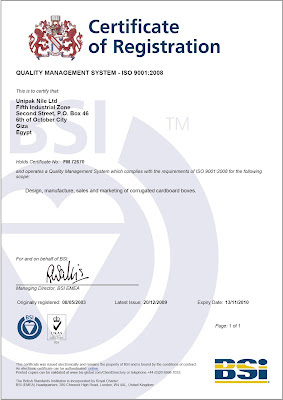 ISO 9001:2008 ensures that Unipak Nile integrates business objectives into processes and measures performance, in order to improve operations, product quality, and risk management, as well as reduce waste. ISO 9001:2008 re-certification confirms that the corrugated packaging manufacturer implements necessary processes to ensure effective product/service delivery and customer satisfaction.